Throughout the ages a narrow bridge made of granite slabs across the East Dart caused many a bottleneck! 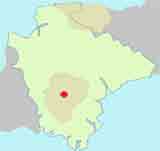 It was on the main road almost half way between Tavistock and Moretonhampstead and lead to the emergence of a hamlet named after the bridge - no ,not Slabbridge (locals referred to slabs as posts). The earliest Victorian maps show a 'temperance' hotel for teetotalers,various bronze age stone & hut circles and several footpaths . Today's forest seems to have been planted much later. 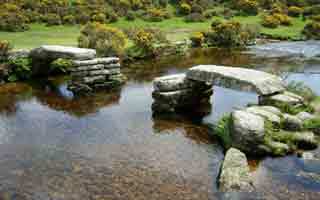 An easy and popular walk to Bellever Clapper Bridge. A From the Car Park enter Bellever forest. It is difficult to imagine that ,a century ago ,this forest did not exist. B Continue along the path to Bellever Tor,an area full of prehistoric interest. Unfortunately,during the Victorian times,it became a haven for 'souvenir hunters'. You can skip the climb and follow a path to the left of the Tor. There are several opportunities to explore prehistoric cairn and stone circles. CAfter re-entering the forest you reach the hamlet of Bellever ,beyond which is another clapper bridge well worth seeing. 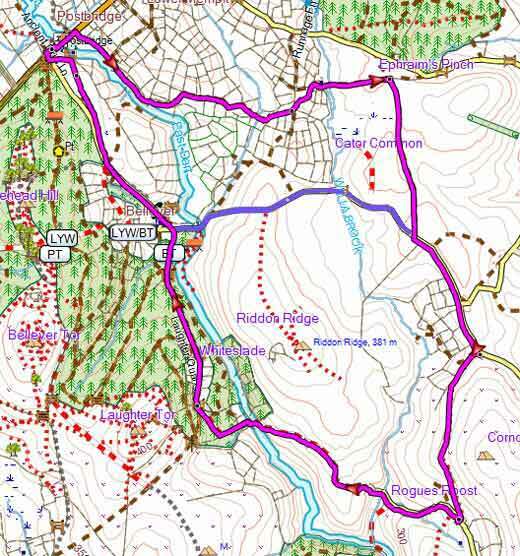 D The walk joins part of the long distance Lych Way,an old route used for religious purposes linking Bellever to Lydford - click here to download Lych Way. A unique walk with extensive views to a prehistoric oak wood. 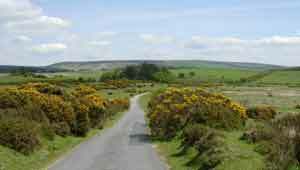 Princetown offers the walker spectacular views of Dartmoor's almost volcanic landscapes. Relive a railway journey through quarries. A great pub walk to Meavy and Burrator Reservoir with spectacular views of a dramatic landscape featured in the film 'War Horse' . A longer walk past Postbridge's clapper bridge following mainly public foot/bridle paths to Cator Common and returning via Sherwell and Laugher Hold house. From the car park walk along the main road & across the bridge to a foot path on your right. 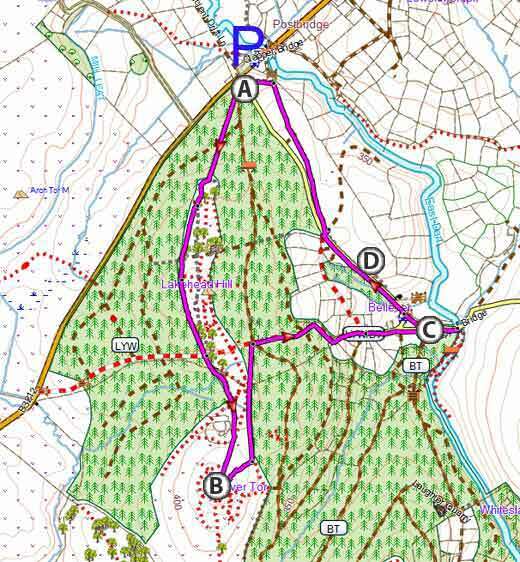 To avoid the stepping stones you could follow the blue route along a country lane - see map.